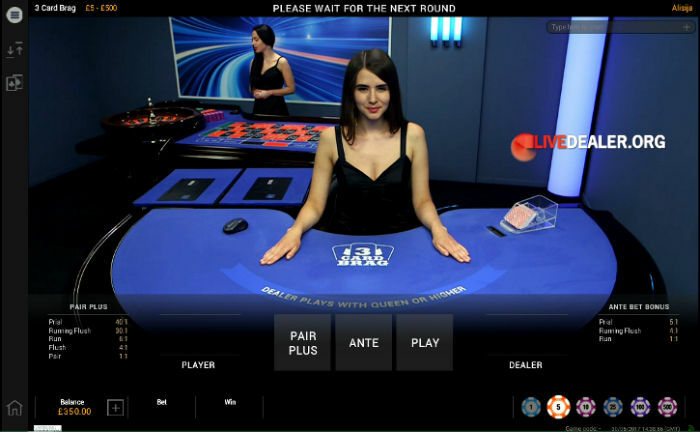 Playtech launched their live dealer Three Card Brag table in May 2017. It’s a 3 card deal, house poker game, dealt from a single deck that is re-shuffled each round; similar in many respects to Evolution Gaming’s 3 Card Poker but with a couple of key hand rank and pay-table differences, which result in this game having a slightly higher theoretical return to player rate. Shortly after launch 3 Card Brag was available to play at Paddy Power, bet365, and Betfair live casinos. the Pair Plus side bet. In essence, the aim of the game is to beat the dealers 3 card poker hand. You begin by placing an Ante bet. 3 cards are then dealt face up to the player hand. The dealers also draws 3 cards, face down. 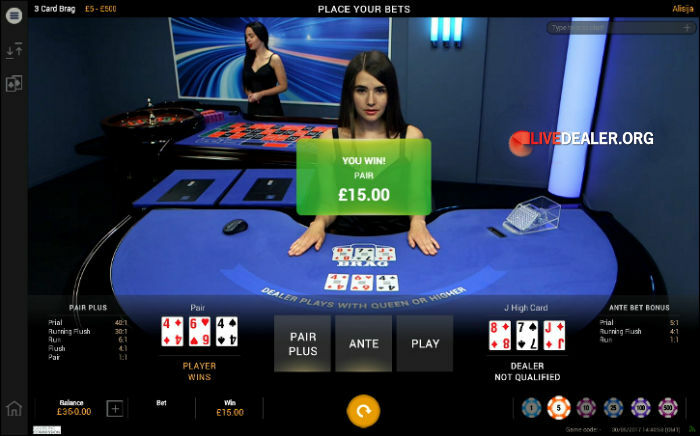 You must then decide to whether to see the dealer’s hand, in which case a Play bet (equal to your Ante) is placed, or fold and forfeit your Ante bet. If dealer’s hand qualifies (Q or better) and is better than the players’ hand, your Ante and Play bets are lost. If the dealer’s hand qualifies and is worse than the players’ hand, you win even money on both your Ante and Play bets. If the dealer’s hand doesn’t qualify you win (even if your hand is worse than the dealer’s) even money on your Ante bet and the Play bet is returned/pushed. There is also the possibility of collecting a payout on the automatic Ante Bonus (see below). You can take the Pair Plus side-bet in addition to the Ante bet. If you fold your Ante bet, you also forfeit you Pair Plus side bet (although this is unlikely given you have a strong hand to play). If you do not fold, you will win a payout on your Pair Plus as set out below, regardless of the dealer’s hand. Not a bad returning game. In fact slightly higher returning (for both Ante and Pair Plus) than Evolution Gaming’s 3 Card Poker, owing to the different hand ranks and payouts offered. A couple of recorded hands of 3 Card Brag….